These are built using original materials, techniques and finishes. They are light and seaworthy boats, descended directly from Viking craft and have hardly changed in the last 1200 years, a tribute to the near perfection of their design. Ideal for lake and coastal sailing and rowing, they can be launched by one or two people and will easily carry two adults and two or three children for a day’s sail. 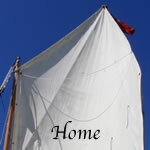 They make great cruising boats for daysailing and camping and trail beautifully behind a car. They are the ideal companion for a family holiday in Britain, Europe or Scandinavia. Above all, they are absolutely beautiful and will start conversations wherever you go.